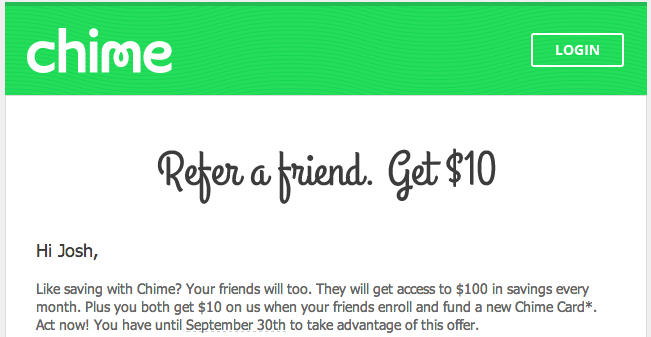 For about a month now, Chime has offered a $10 bonus for new sign-ups and a $10 bonus for the referee. It was a great promotion to get new sign-ups, but it’s coming to an end today. If you have not signed up yet, make sure you do it today. 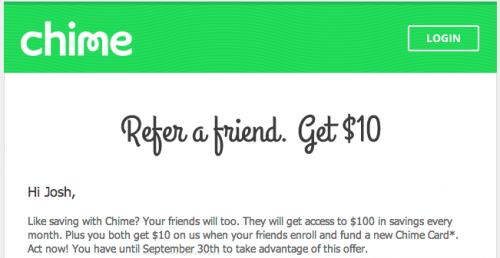 If you have a Chime account, feel free to leave your referral link in the comments. Recipient must enroll using the link above, successfully pass ID verification, and fund their account with a minimum deposit of $50 on the first transfer by September 30, 2014 for both parties to qualify for the $10 rewards. If you have never heard of Chime or you want to learn more about it, check out this post.